A little Molotow through an airbrush and some ink stuff I picked up somewhere. Nice work on the grill. I wish I had done that on mine and put the black on. Added some paper gauges to dress it up a bit. I think you'll be able to see some of them once it's installed. A lot of nice things are happening! Lookin' good y'all! I got the chrome fixed! So the grill is now done. Well the the dashboard on this truck is beyond bland. just a basic black molded part. I added Molotov Chrome to the AC vents and the stalks on the column. A little white paint on the knobs. Next up some paper cutouts for some instruments, and a speedometer. It's not that the kit had decals or stickers that didn't survive till I got the kit, there's no indication that they evenr intened to add them to the kit. and that is some extreme detail there Gabriel. Well I got the base coat of flat red on my delivery van.. will have to sand a couple of places and mist over a 2nd coat to get it up to par.. I used Vallejo Flat Red for this as I am experimenting with this paint for this build. The red seems to be a little smoother than the black was.. anyways here is the photo.. There was no way to make the turbo exit and muffler inlet connect properly. There is a 2mm gap where the pipe ends before meeting the muffler. I could force it but in doing so I would have the engine completely lifted from the mounts and I am quite sure it's sitting as high as the space under cab allows (I dry fitted them). I guess I'm going to live with that - I don't feel like tearing everything apart again and stretching the pipe with heat... no way. And to see the gap you really need to crawl under the truck and you're not allowed to, OK?! And so she's looking thus far. I will install soon the fifth wheel - it's still in the painting booth because - you guessed - I'm running some paint experiment on it like I don't have enough trouble already! Time has come to add the last bits to the chassis frame. The turbo exhaust pipe it's a naughty one. I was quite pleased with the result and moved to heat stains. That was mostly a style exercise because just a tiny bit will be visible (on the mirrored base that is). It's not the typical plastic assembly kit. So I hope it's allowed. MD, looks good to me. Welcome aboard. Rob, decals look good to me! I have the Molotow refill - just haven't had any chrome to try it on. Honestly, I think I'd clean the chrome off first, then shoot the Molotow. I used to use oven cleaner. Never had any plastic melt and I've let it soak for a few days. Different kits, different plastic? I now use Purple Power. Much quicker and "cleaner." Less hassle too. It's readily available in the States, but not sure about overseas. Something to look into? Pour it into a container, set the parts in and (literally) watch it start to remove the chrome. Delbert, Model Color is great for brush work but it sure does need to be thinned for the AB. 80% of my Vallejo is now Model Air. It can be touched up with a brush straight from the bottle - light coats with a good brush works and you can hardly tell if it gets "feathered" to the AB'd paint. Gabriel.. I've had some success in removing chrome by lightly spraying with oven cleaner and putting them in a ziplock bag overnight.. remove, brush and rinse, repeat as necessary. I used this to remove the chrome from a lindberg kit and had no problem with parts getting soft. Now on to my progress on the 1923 Delivery "T"
Today I airbrushed various small parts, the Chassis, and the body Interior Flat Black. Now for the Twist. I used Vallejo Model Color Black Acrylic paint. This is only the 2nd time I have airbrushed these. They require a lot of thinning.. about 50/50 in order to airbrush them. And here is the uninspiring photo of some stuff painted black.. and yes I know I have to touch up the inner frame rails. Just couldn't shoot the paint in there completely. Thanks, I don't want to remove it I just wish I had a Molotow refill so I could airbrush it! About "fighting the chrome": I just bought a ultra-sound cleaner for my airbrushes and empty jars... I wonder if I can use it for removing the chrome plating? Did somebody try it yet? 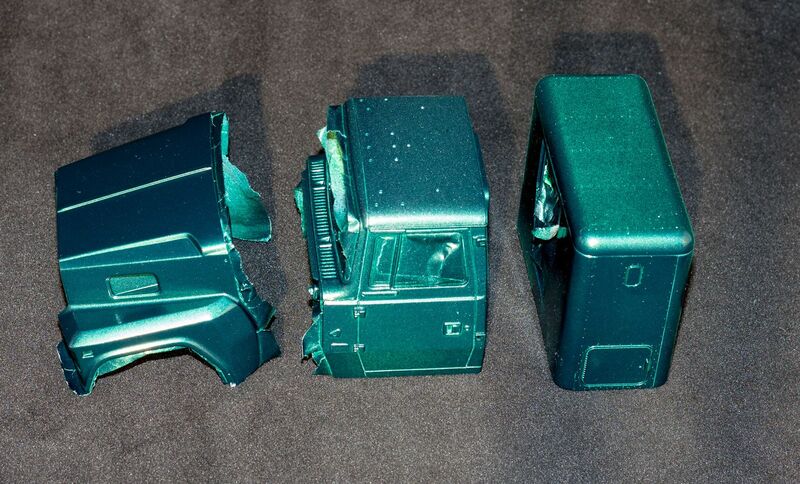 On my Mack build I was successful in removing the chrome but not as successful in removing the lacquer MPC used as base coat for chrome. And dipping too long the parts in oven cleaner or Clorox leads to softening the plastic... one cannot overdo it! I think I have finished with fighting these decals now it's time to fight with the chrome! 1:28? Really? I'm sure you'll do a great job on it, but the manufacturer needs to be smacked in the head for that scale - too small to go with 1:24/25, too big to go with 1:35. Sheesh! 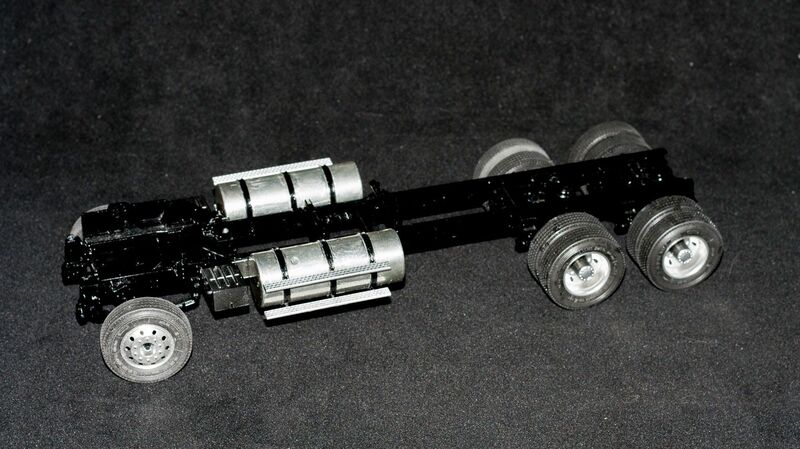 Here's my entry, Testor's 1/28 Kenworth T600 from their ultra metal series. Yes, that's what I really paid for it at a local thrift shop. It's a bit started, I think it's less than 25%. Mostly the engine and a couple of frame components. Lotsa little parts to sort through. The fit of the cab to the hood needed some work and then when the interior was added the cab bows out so I will have to trim the interior to fit. Gabriel, Really coming together. The attention to details is really paying off. Delby, That looks like a fun little build. OOB is my favorite "album"
Neat little truck Delbert. Really looking to see how it progresses. Delbert, sometimes keeping the things easy it's the good way... some chillin' how the word goes here in Caribbean .